We're not as far along as we should be in the Halloween costume creation department. I've pretty much made the executive decision that Susie has to be a princess (because we have the dress - why else? ); but Rachel fell in love with this costume that I saw on Pinterest. It should be really easy to make, but the devil - as always - is in the details. 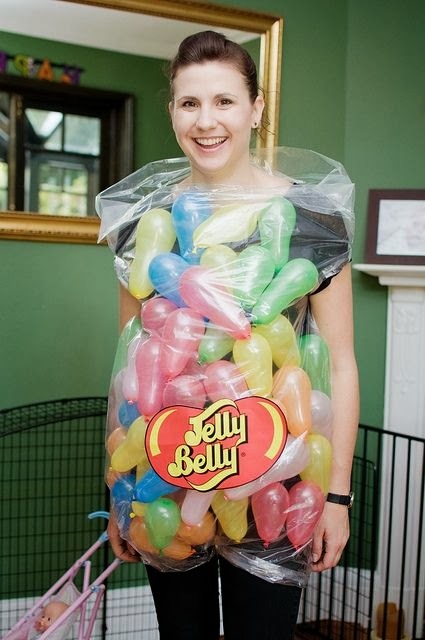 Tell me, what shape balloons do I need to buy so that, when half-blown-up, they will resemble jelly beans? Round? Long? Does it matter? Because, really, I haven't the foggiest idea. I know I should just buy both and the heck with it - it will still be the cheapest costume ever. But, somehow, I've looked at balloons several times at Target and Michaels and still come home empty-handed. Just tell me what to do, will you? I am being plagued by indecision here. I'd like you to know that Auntie Kate has been here for over 24 hours and we have not yet been to Joanne's. Nor has Larry had any excuse to practice his mad staple-gun skills. I have that bag of material that I mentioned at Bunko. It's mostly velvet and Thai silk. There's also some yarn and embroidery thread. You're welcome to it, if you think you can use it. If you think you can use it? Is the Pope Catholic? Is the sky blue? Is Congress most definitely not earning its keep? Still here - Auntie Kate visit impending, so not only do I have to clean up this house so she cannot see the squalor in which we ordinarily dwell, but I also have to sort out my sewing drawer, fabric stash, yarn stash, etc., in preparation for our annual crafting binge. Oh, yes, and plan some sort of food - that would be helpful. So, yeah, busy. I just want to reassure you folks, as the holidays approach, that this should be a Christmas-prep-free zone until at least the 15th of December. So, if you are already becoming overwhelmed by seeing blog post titles such as "Starting My Christmas Shopping!" or (worse) "Finished My Christmas Shopping!" or "Complete Menus for the 12 Days of Christmas," rest assured you can come here and not risk suffering the panic attacks that normally accompany such frighteningly festive screeds. Crazy to leave it all until the last minute? Stressful? Actually, no. I've run this experiment since 2009, and it has been a resounding success - thanks to Amazon's 2-day shipping, which saved me that year of the freak pre-Christmas blizzard. Save Christmas for Christmas, folks - that way you aren't sick of the whole darn thing by the time the 25th rolls around. I've disappeared for a bit again in order to go back to my dad's house and continue cleaning out an accounting office where essentially nothing was thrown away for, oh, 35 years. NOTHING. Paper clip, anyone? We seem to have plenty. I couldn't face the discomfort of sleeping on the couch again (not after all those hours in the car), so I screwed up enough nerve to sleep in the only available bed, which happened to be in my dad's bedroom. You know, the room in which he passed away a mere month ago? You would be correct in assuming that I kept the light on. I suffered no hauntings, however, and arose refreshed to face the veritable mountain of paper and office supplies which awaited me. We filled up the garage yet again with boxes of stuff to be recycled or given away or thrown out. I managed to get rid of 2 huge old office desks and a bookcase (thank you, Craigslist! ); and I spent more time gathering photos that I will bring home and beg David to scan into the computer. A good day's work, but there is stuff I still have not even touched. Which brings me to the real point of this post: people, walk directly to whatever filing cabinet you might have in your home and empty out a folder or two. Now. Just do it. Repeat this exercise at least once a week. Your children will thank you for it someday, I promise you. Oh, and really? They won't care too much about your high school yearbook. Feel free to toss that, too. 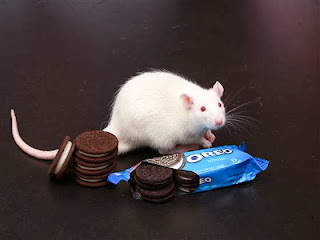 Vindication, people, that's what this study concerning rats and Oreo cookies is - vindication for every time Larry has asked me, "But WHY can't you eat just 2 Oreos and leave the rest of the package alone?" See, Larry? I'm addicted. It has nothing to do with willpower or discipline - it's brain chemistry. Schroeder’s neuroscience students put hungry rats into a maze. On one side went rice cakes. “Just like humans, rats don’t seem to get much pleasure out of eating them,” Schroeder said. 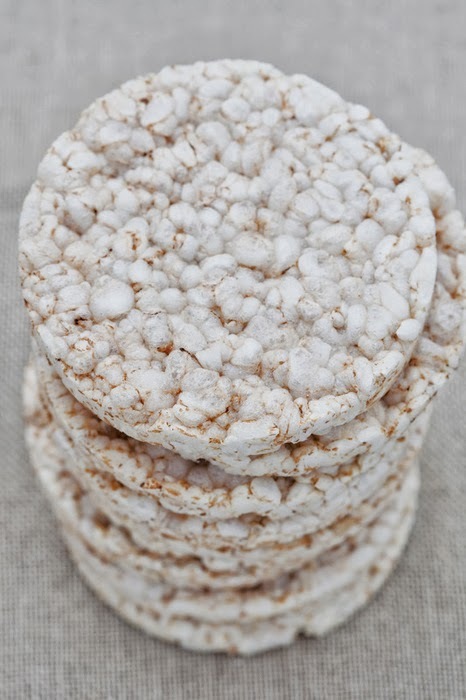 In other words, when trying to think of something that was as unlike the yumminess of Oreos as possible, the architects of this study came up with the lowly rice cake. "Imagine that!" said Larry, feeling himself vindicated once and for all in our longstanding rice-cakes argument. "I told you they tasted like styrofoam." Theo came to visit us this weekend, and we took advantage of having 2 resident babysitters in the house by going to see Captain Phillips. 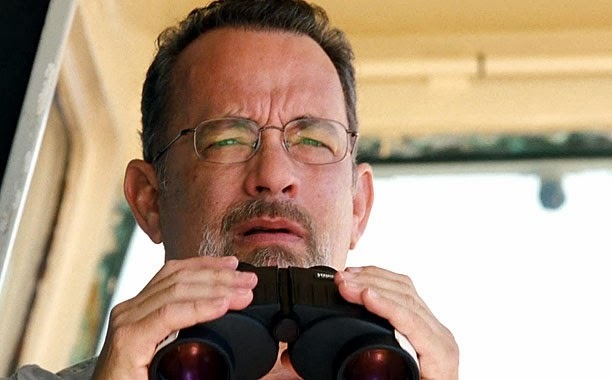 People, I've never been a big Tom Hanks fan (although I do think that, if you take any movie Steve Martin has been in and replaced him with Tom Hanks, the movie would have been WAY better), but he was EXCELLENT in this film. Just WOW. And, to make my day even better, there was a preview for another movie (coming in December) that will star George Clooney, Matt Damon, John Goodman, and Bill Murray. "What's it about? " asked Larry, who missed the preview because he was getting our popcorn. "What's it about? I don't know. I don't care. MATT DAMON. BILL MURRAY. JOHN GOODMAN," I told him. Seems like just yesterday that I wrote this post about baking my husband's birthday cake...and it seems like just the day before yesterday that I wrote the instructions for that same cake here. 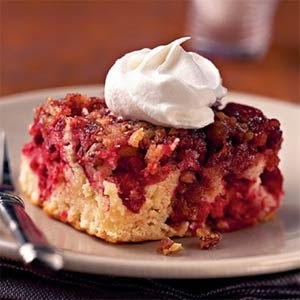 I swear, my life is on fast forward and it is time once again to indulge in that annual extravaganza known in these parts as baking the cake that I am not even sure my husband likes. But I still don't have a present for him. Last year we bought him an IPod Touch with my BlogHer earnings, and it is sort of a tough act to follow (unlike the spiffy 4.1-gallon paper shredder we had bought him the previous year). I am plumb out of ideas, folks. Reasonably priced suggestions, anyone? Relax! Be Happy! Or Else! The study followed 800 women for 38 years and found that those who reported being stressed during middle age (i.e., the NORMAL people) were 21% more likely to develop Alzheimers as they got older. Listen, folks, stress is synonymous with middle age. Think about it: teenagers, wrinkles, menopause...the list goes on. And now I'm being told that it's all an express ticket to the Alzheimer's rodeo? Gee, I can hardly wait. 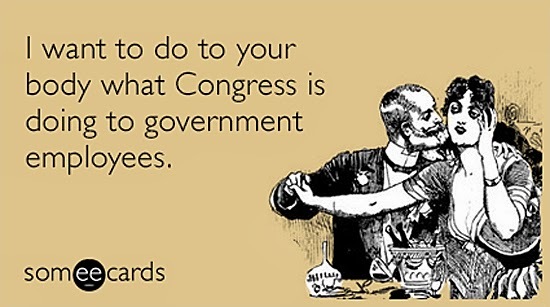 I am trying hard not to dwell on the budget impasse/Obamacare/debt ceiling imbroglio, but please - if you happen to be a Congressperson who believes that the threat of a government shutdown is a legitimate budget negotiating tactic, then don't suddenly be shocked - SHOCKED - when certain gov't services are not being provided during the shutdown that you yourself have rashly precipitated. Or, better yet, come back to the bargaining table to discuss the BUDGET, not a healthcare law that has already been passed by Congress and declared constitutional by the Supreme Court. Also, please don't keep raking in your paychecks while you are depriving the federal workforce of theirs. It makes you look like the hypocrites that you are. Not to mention that you are increasing my risk of Alzheimers by stressing me out with your talk about how you NEED your paycheck to pay your mortgage, unlike the rest of America, I guess. I need to cheer up. Maybe I'll go watch Season 1, Episode 2 of ALF again. The jigsaw puzzle joke gets me every time. Now that we've watched all of the episodes of I Love Lucy twice over, it's been pretty difficult to find good TV shows that are both family-friendly and watchable without wincing. I mean, think about it - no obvious sexual content, no disgustingly sarcastic children, no disgustingly sweet children either. Also? Funny. They have to be funny. So, in an unaccustomed burst of brilliance, I decided to try out ALF. I remembered it vaguely from the late 1980's, when a neighbor of my parents (and their generational cohort) would watch it religiously and laugh himself silly; but I was in my 20's then and felt a little too cool for it. I gathered David (16) and Brian (13) in the TV room for a screening last night. Oh, people, ALF was funny, all right. Brian enjoyed it outright, and I caught David laughing also. We watched the first 3 episodes and no one objected. Alf is the extra-terrestrial version of a Borscht Belt comedian. His timing is impeccable. The youngest kid is cute, but not so much that you want to stab him. The teen girl is not snarky, just pleasant. Granted, that last is not very realistic, but what do you want from a show whose main premise is that an alien life form is hiding out in the house of a very suburban family? And whose running joke is that he really wants to eat the family cat? Also? The 1980's. The house is decorated in shades of blue and mauve, the teen daughter is wearing some sort of overalls get-up (when she isn't sporting her Laura Ashley dress), the phones all have cords on them, and no one has a personal computer. It's like time travel and a history lesson, all rolled up into one. What was up with that blue-and-mauve thing, anyway? Today? Is a day of triumph. A day of rejoicing. A day, even, of reveling in that all-too-rare feeling of having at least a modicum of control over my own life. As detailed here before, I am the official tub-drain declogger in this family. With my mad Rosie the Riveter handywoman skills and my cute pink tool kit, I have figured out how to remove that little cover from the drain hole and pull out the disgusting matted sodden mess of hair and soap bits that is preventing the water from exiting the tub in a timely and graceful manner. I know! You envy me. And, yet, recently, my efforts have not been enough. Apparently, there are knots of hair somewhere farther down in that pipe that my fingers can't reach. The upshot being, we've all been showering with our ankles in a couple of inches of water for the past month or so, while my frugal self has struggled with the concept of having to pay a plumber 100 bucks to clear the drain. Now, I have been a fan of the Flylady since 2002; and I credit Marla Cilly with saving my family from living in utter squalor all these years. Still, I never quite believed her when she claimed she had a tool that could unclog drains. I would read the description and the testimonials, and then I would shake my head and move on. Until this week. 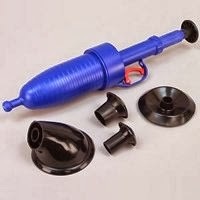 This week, I became desperate enough to bite the bullet and order a Clog Cannon from Flylady's webshop. It arrived today. And, to my disappointment, it didn't seem to work. In fact, things got worse, to the point that the water wasn't draining at all after Susie's shower. Faced with the prospect of telling Larry that I had messed things up completely AND wasted $25 in the process, I grabbed that Cannon and applied it to the drain again. And again. And again. "What's going on in there?" I heard Larry say from the hall. "Nothing! Just cleaning the tub!" I shouted, as I threw all my weight behind that darn device and prayed to Flylady to give me a miracle. Somewhere around the fifth time, the magic happened. I heard the drain gurgle (oh, beautiful sound!) as that water slid swiftly, gracefully, to wherever it is that bathtub effluent goes. I spent the rest of the evening singing "I am Plumber, hear me roar..." and waving my Clog Cannon at Larry, who did not appear to be at all impressed with my fix-it skills. You know what? I think he's jealous. 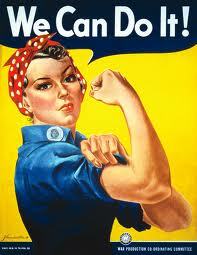 There's something been going on around here lately - a lifestyle change, really - that I haven't been sharing with you. 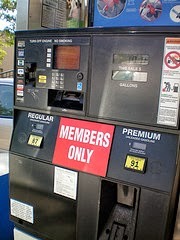 It started innocently enough, when a friend mentioned that gas was a lot cheaper at Costco. 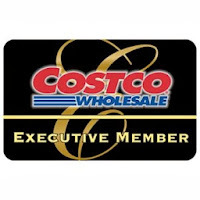 Now, you have to understand that, all these years, I've been a Costco refusenik, refusing to join the masses loading up those giant carts with huge boxes of foodstuffs and 48-roll packages of toilet paper. Oh, yes, there have been times I've looked wistfully at my friends' tubs of Costco salsa and their giant frozen lasagnas, but I've been able to get past all that and move on with my life. But cheaper gas? I realized that I drive right by a Costco once a week, while the girls are at art class. So, hey, I'll just check it out, I thought. I don't have to buy anything. Just, you know, LOOK at the prices, make sure I'm still getting a better deal at the military commissary I frequent once a month. Oh, it is indeed a slippery slope, people - it took me less than an hour of walking around Costco and doing some rapid-fire calculations re the gas money savings more than making up for the membership fee, and suddenly I'm filling out a membership application and buying 90 dollars worth of granola bars and corn chips and the like. NINETY DOLLARS. No, actually, I'm in deeper than that. I opted to become an EXECUTIVE member (hey, an additional 2% back on purchases), plus I agreed to sign up for the special Costco-issued American Express card (an extra 3% off the already low gasoline prices!). And....well...I'm excited about it. Apparently, I needed something different in my life, something to look forward to each week. Who knew that that something was just a bit of warehouse shopping? I haven't told Larry about the extra credit card yet, mostly because I hate watching him bang his head on the computer keyboard like that. You see, he is a one-credit-card type of guy. And I don't think he'll understand if I tell him that, as far as dealing with mid-life crises goes, this is a fairly uncomplicated solution, more convenient for our family schedule than twice-a-week belly-dancing lessons or monthly yoga retreats. Maybe I should just lure him in to the warehouse-shopping madness by telling him about Costco's low, low prices for cases of Sam Adams. Everyone has their price, right?